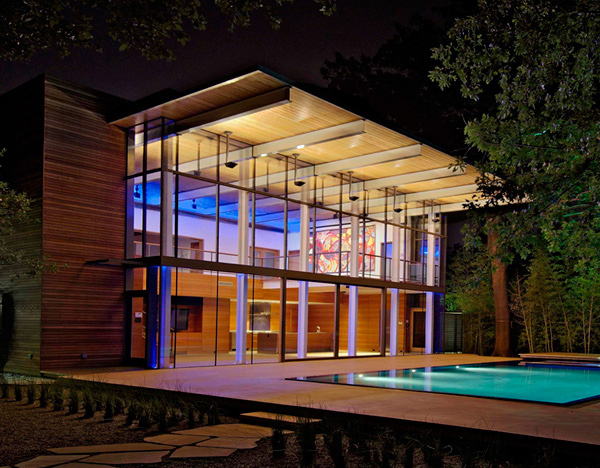 Here is the 5,250 square foot modern house which is located in Dallas, Texas. This house is labeled as the House in the Garden. One of the most striking features of this is the privacy wall. This is made from the recycled glass, and illuminated from within. The glass wall gives no indication of the urban oasis behind. This house is made is an extraordinary house which is created through the air intense collaboration between the architect, the client and the landscape architect. In fact there is a great amount of thought was integrated into every detail all through the entire design as well as the construction procedure. They used the fluid procedure for it was necessary in order to profitably present a functional house which is evenly competent to host an informal gathering and large social functions. As an urban retreat for an artist and enthusiast who lives next door, the designer intend to quietly insert this new house into the neighborhood. Yet this house design is to be able to express the unique identities of the owners or the clients. In such a way that the client’s affinity for the color blue was incorporated into several elements dominated in the garden and the house. 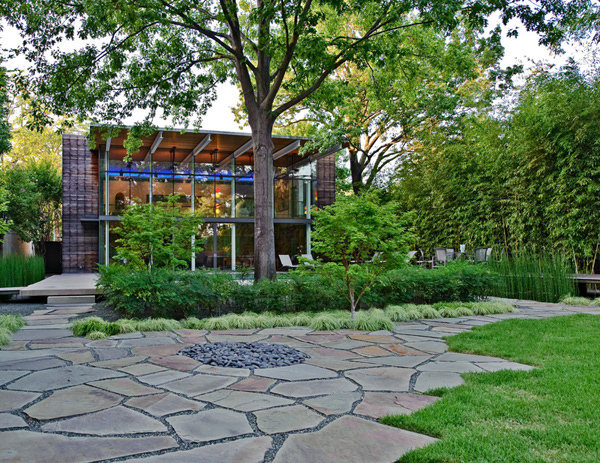 The House in the Garden is described as a free-standing addition to an elegant modernist house in an adjoining lot. Moreover, there is a number of existing Red Oak and Elm Trees built in the garden design whereas both of these contributed much to the formation of a larger en masse. Also there are minimal plant palette mass plantings which used for large textural impact and screenings for privacy purposes. As you can see this house seems like a modern two-story box cladding on a three sides with a rain screen system. 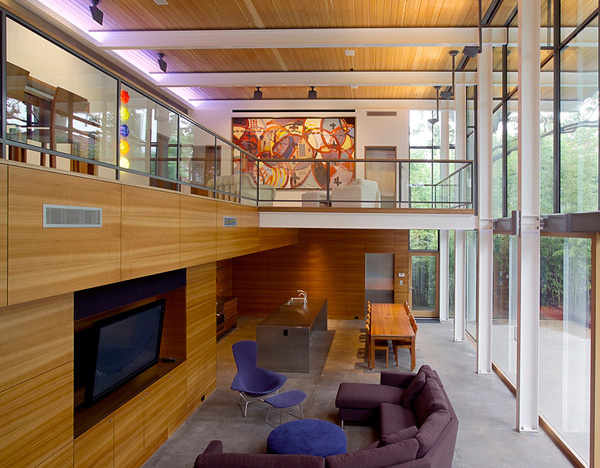 This house utilized an Ipe Hardwood that will weather over time to a silver-grey sheen. While the south façade is glazed in frameless is insulated in a glass units that include two 8 foot wide sliding glass doors. Now you may see more of the details of this House in the Garden through the images below. Here is the appealing entrance of the house as you can see the built in recycled glazed wall. You may take a glimpse of this house that is seated in the middle of the green trees and plants. The high quality materials of the furniture and the high tech appliances are presented in this spacious interior. 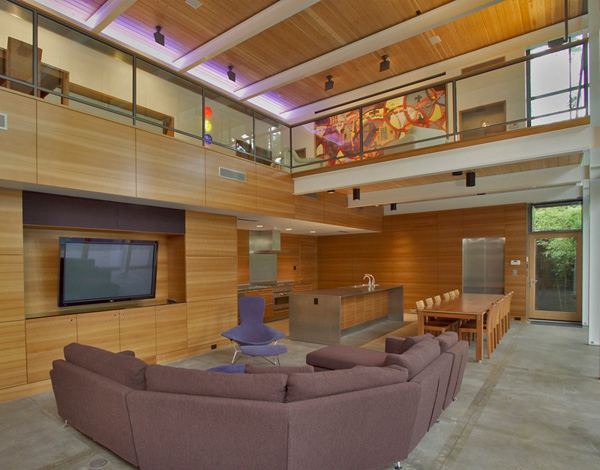 Here is another sight of this living room where you can see the sofa as well as the wooden walls and ceilings. 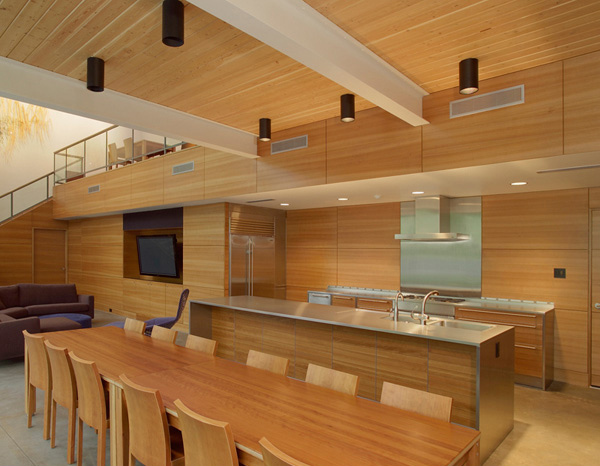 You may notice the simple but elegant dining set made of woods as well as the sink in this dining and kitchen area. From the interior you may freely see the infinity pool because of this sliding door that is made of glass. 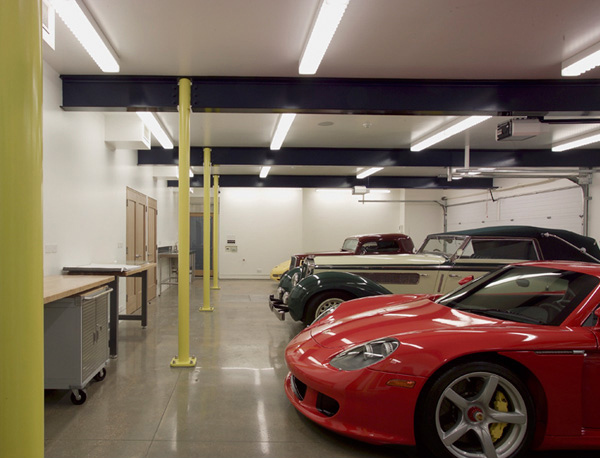 The array of lights and white palette are seen in this garage where the cars of the client are parked. The serenity and peaceful environment is highly observed in this area where you can see the connection of the house close to the nature. In the morning, this house offers a perfect place to unwind and relax while enjoy swimming in this pool. 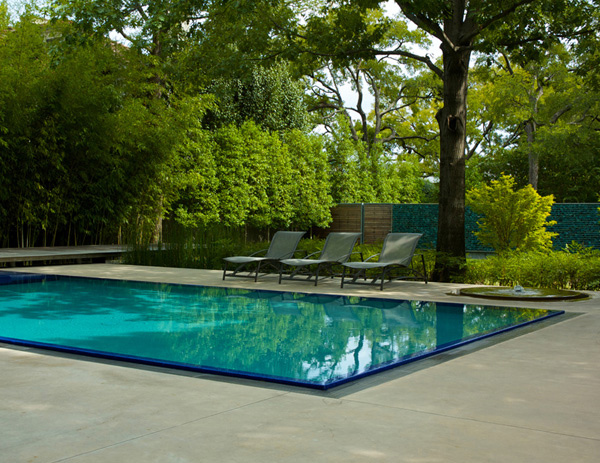 This area may allow the client to sun bath and refresh from this cool and fresh water in the pool. 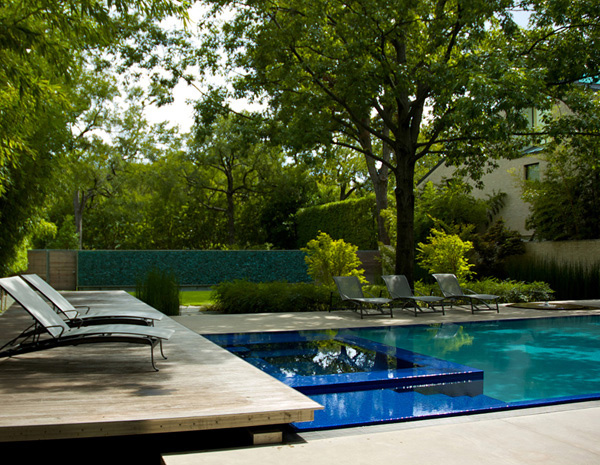 One of the client’s favorite features is this infinity pool that sums up the modishness of this house. 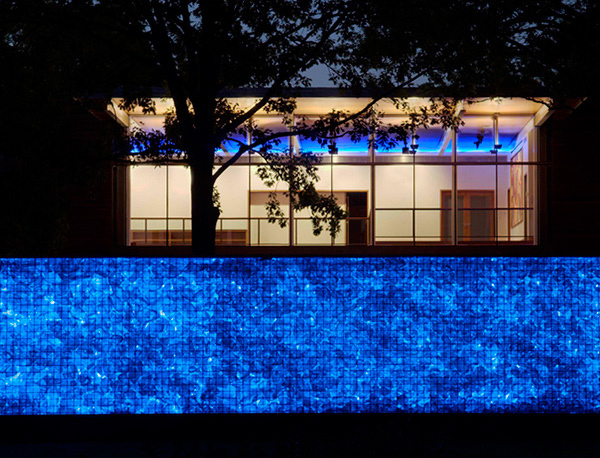 At night, this house offers a Technicolor scheme effect in the interior that seems like its glowing in the middle of the dark. 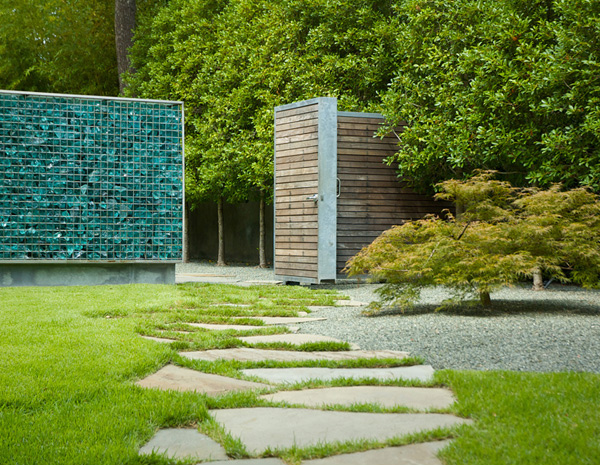 The glowing in the dark effect of this recycled glass wall in the entrance of this house is one of the highlights of this house. 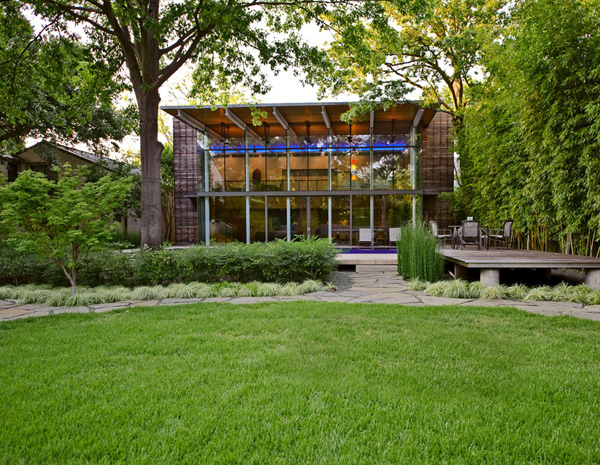 This house has a 14 foot cantilevered roof which protects this building from the severe Texas sun. 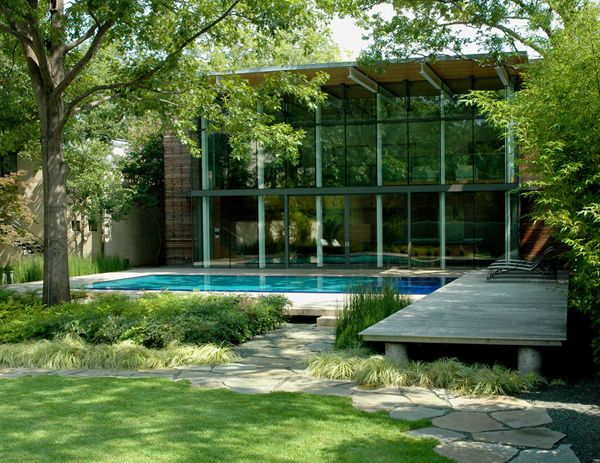 This also serves as a porch to the glass-tiled infinity edge swimming pool. There is a small water feature cast into the concrete deck that provides a subtle noise to eradicate any interruptions from beyond the garden walls. While there is a large stone slabs here becomes the “connectors” throughout the garden. It provides the transition from the street to the bedroom and painting studio on the upper level. Whereas in the downstairs the concrete floor and exterior deck provides a seamless transition from the living garden.Besides this house offer an ample space for part of a larger collection of art and automobiles. This house is looks like one of those bowling alleys in the 1980s because of its Technicolor lighting scheme effect. This is also described as “boxed” and it is an eco-friendly house which is definitely a perfect pad for relaxing lounge time. Thus this House of Garden is successfully designed by the Cunningham Architects and they worked together with the Hocker Design Group who recently received an Honor Award from the American Society of Landscape Architects for their hardworks on the landscaping. This House in the Garden definitely has an inspiring design and we hope that we gave you another insight for you to come up with your dream home. Now it’s your turn to share your thoughts with us.